As Britain exits the European Union, the Arizona Geological Survey is exiting Arizona state government for a new future as a research and service center at the University of Arizona. We have one year of partial transition funding to become entirely self-supporting from grants and fees for services. 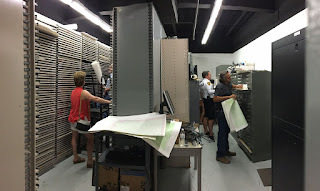 AZGS shut down the retail store on Thursday, emptied out the library of all remaining volumes, and gave away ~25,000 topographic maps in preparation for the physical move that begins on Monday. There is no room in our campus space for these materials and activities. The Phoenix office assets were moved to the old mining museum today, with volunteers scheduled to arrive July 5 to transfer the library materials from carts and gondolas to the bookshelves we are sending up from Tucson. The government of Arizona is going beyond foolishness in their efforts to line the pockets of their richest citizens. There will be bad repercussions from stupid moves like this. This short sighted blunder is absolutely shameful. The citizens of arizona have not been served by the staff that recommended this to the governor and the governor should have had more common sense and understanding of what the survey means to this state. Shameful.